The meet started with No. 8 Cal and No. 11 Iowa lined up on one side of Haas Pavilion. Evident by the cheering, the stadium was full of more Hawkeye fans than Bear fans. And despite Cal’s tough fight, a few crucial mistakes caused the Bears to fall to the Hawkeyes by three points, and fall to 1-3. The meet started with the Bears on the floor exercise and the Hawkeyes on the pommel horse. 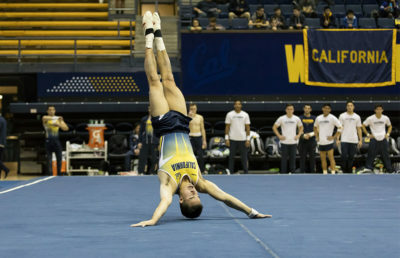 As shown in previous meets, the floor exercise proved to be one of Cal’s stronger events, though they only beat Iowa by just less than one point, 68.850 to 67.900. 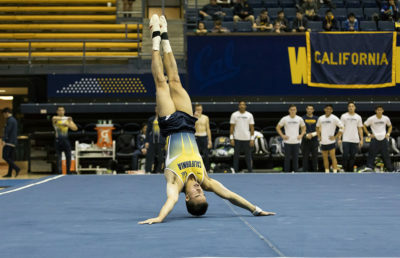 Each of Cal’s gymnasts scored at least 13 points on the floor, while sophomore Aaron Mah lead the way with 14.4. Iowa senior Cory Patterson started the meet off for the Hawkeyes, but struggled on the pommel horse, scoring a 12.5. Luck was not on the Bears’ side for the pommel horse, as each of the gymnasts competing in the event struggled. Sophomore Bailey Chang started the team off with a score of 12.650, while sophomores Roshan Toopal and Aaron Mah both fell off of the pommel horse. They had to each thus get back onto the pommel horse to finish their routines. The latter two finished with scores of 11.0 and 11.2, respectively. The team looked on as junior Yordan Aleksandrov finished the event for Cal. 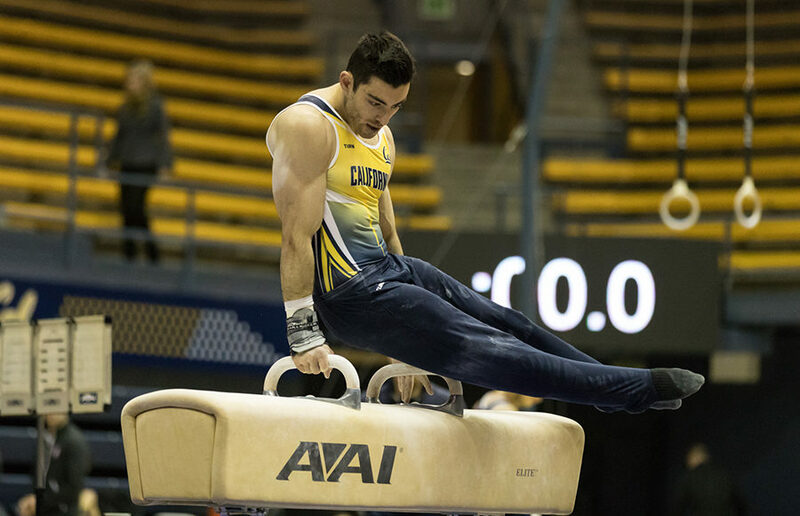 As soon as he finished the event and dismounted the pommel horse, however, Aleksandrov shook his head, perhaps in disappointment as he looked at at Cal head coach Brett McClure. Aleksandrov finished the event with an 11.300. Even on the rings, the Bears experienced more falls. Sophomore Harrison Plate fell down from the rings, while sophomore Bailey Chang could not stick his landing. Despite the minor mistakes, junior Yordan Aleksandrov helped the team get back on track by scoring a 13.900. Captain and graduate student Capri Sano also performed well on the rings, earning a score of 13.800. “We had some setbacks today, but overall, it was a pretty good fight,” Mah said. Iowa, competing on the vault while Cal competed on the rings, had strong performances. Senior Andrew Botto scored higher than his average, 14.125, on the vault, tallying a 14.500 and recording a new individual season high. Iowa junior Dylan Ellsworth scored right at his average with a 14.300. Cal, however, did not let up on the vault. Redshirt sophomore Nathaniel Ramil scored a 14.150 on the vault, while Mah scored a 14.300 and redshirt junior Michael Rauchwerger also broke 14 points with a 14.200. The vault was not enough to save the Bears from their earlier events. McClure acknowledged the Bears’ tough battles on each event, especially on the pommel horse and rings. “On the pommel horse, the biggest mistake was competing a little tight, and so they had a lot of execution errors,” McClure said. Despite losing for the second time to the Hawkeyes, the Bears cannot let their heads down. They have another big home meet approaching quickly this coming Saturday, and they must continue working toward improvement in order for the results to show in their score.